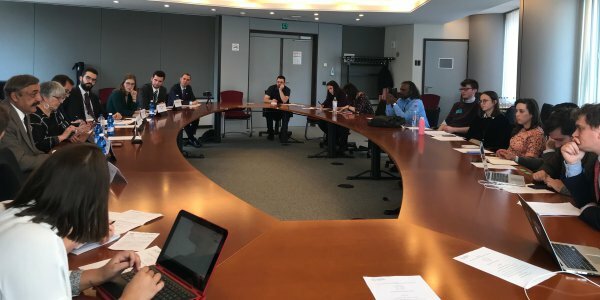 Yesterday, 10 April 2019, UNPO held a roundtable at the European Parliament titled Protecting minorities in Pakistan through EU Mechanism, hosted by MEP Csaba Sógor (EPP) and with the participation of MEP Julie Ward (S&D). Bringing together representatives of human rights NGOs and staff members of the European Parliament and European institutions, participants had a constructive debate on how to overcome challenges to advance human rights protection and promotion in Pakistan through EU mechanisms, such as GSP+ and the European Instrument on Democracy and Human Rights. MEP Csaba Sógor (EPP) opened the roundtable by feeding the participants with data on the persecution of religious minorities worldwide, focusing in particular on the dire situation of Christians in Pakistan. Very critical of what he called “EU’s double standards” in its engagements with countries that benefit from GSP+, Mr Sógor deplored the European Union’s overall preference for preserving trade over human rights protection. “We should start by giving a good example at home”, he added. He finished his speech by expressing his hopes that the new parliament will be more prone to take a stand against the persecution of minorities in Pakistan. Fernando Burgés, UNPO Head of Policy & Research and moderator of the roundtable, opened the discussion by sharing the general frustration with the fact that, although the European Commission is aware of the gross human rights violations happening in Pakistan, GSP+ has not been used effectively as a leverage to oblige Pakistan to fulfil its obligations. “Despite the fact that Pakistan has the world's highest number of prisoners on death row, with rampant enforced disappearances and killings of journalists and activists”, he said, “the EU is failing in the effective implementation aspect of the GSP+ regulations”. Alessandro Pecorari, from Christian Solidarity Worldwide, deplored the persecution of Christian minorities around the globe, particularly concerning in Pakistan. Subject to low-paid jobs and poor education, Christians are constantly targeted by extremist Muslim groups, as the colonial legacy of the casts is permanently discriminating against them and other religious minorities. Mr Pecorari drew particular attention to the issue of forced conversions in Pakistan, where Christians and Hindi girls are often abducted and forced to marry. Marie Ghysens, representing the Women’s Eco-nomic and Social Think Tank (WESTT), expressed her organisation’s deep concerns about the women’s situation in Pakistan, one of the worst countries in the world be born a woman. “Suffering in all social aspects, the justice system isn’t capable nor willing to protect the women and often refuses to address their claims”. Ms Ghysens said that the EU does have the leverage to act in Pakistan, but the Commission is too hesitant for fearing losing trust with Pakistan if GSP+ is suspended. She concluded by saying that the Convention on the Elimination of all Forms of Discrimination Against Women (CERD) is far from being effectively implemented and that the European institutions must exercise its influence with Pakistan in this regard. Mirza Wahajat Hassan, exiled Chairman of the Gilgit Baltistan Thinkers Forum, shared his personal experience as representative of the region that has for over seven decades now seen its citizens deprived of constitutional rights. Mr Hassan raised the issue of sectarian violence fueled by forced demographic change, triggered by the abrogation of the State Subject Rule in the mid 1970’s. As a result, non-Sunni worshipers have been particularly targeted and persecuted for their faith in Gilgit-Baltistan. MEP Julie Ward (S&D) reminded the audience that human rights are not negotiable. “If one wants to defend human rights, one has to defend all of them”. Ms Ward acknowledged that the GSP+ is an important safeguard to protect the most vulnerable in poor countries but it has to be used properly. First and foremost, “cohesive societies must be built, in which where everybody cares about each other”. MEP Julie Ward mentioned the Asia Europe People’s Forum, an initiative that supports trade unions and social policies and which is being supported by the European Union. “Social protection can bring people together. It helps in fighting exclusion. A cohesive society and active citizenship are the key tools to make people engage with each other”, she concluded. An exchange of ideas followed the presentations, in which participants unanimously agreed on the importance of GSP+ to bring positive change for Pakistan. However, the EU must refrain from its double standards policies and act with coherence towards all beneficiaries of the tariff scheme. Failing to do that will only worsen its international credibility as a human rights champion and its ability to effectively use trade leverage to promote and protect human rights.